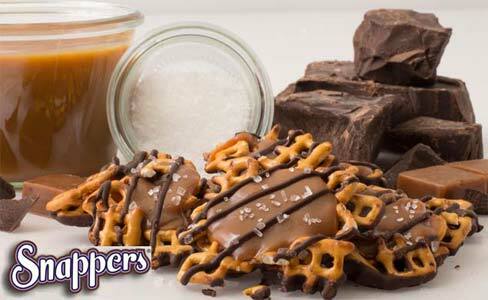 Hitting Costco shelves again at the beginning of May will be Snappers Dark Chocolate Sea Salt Caramel Pretzels. We got the opportunity to review them ahead of time for you and must say, we were pleasantly surprised. They’re also on sale in the upcoming Costco May coupon book, so you might want to pay close attention to this review! At $3.00 off, they’ll be only $6.99 for a 24 oz package, which is a really good price. On Amazon they’re $15, so you can see how good of a deal this is! By the way, the May coupons will be running from May 5th through May 29th. 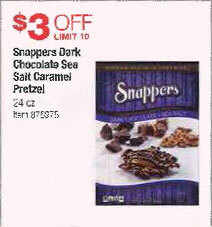 The first thing we noticed upon opening the bag was that Snappers are not just a single pretzel with a bit of caramel. 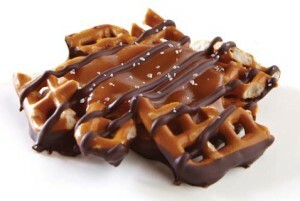 They are a group of multiple chocolate pretzels stuck together with caramel. This makes them multiple large bites per Snapper. We also noticed their high quality design, with nicely drizzled dark chocolate over the caramel. Upon taking the first bite our initial take was that the proportions of pretzel to chocolate to caramel to sea salt were really spot on. There was not too much of one thing or too little of another. Our next take was that we definitely noticed the bits of sea salt, but it wasn’t too salty. We were expecting it to taste like a chocolate pretzel, and that it did. What we weren’t expecting, and what makes the Snappers so different, is the caramel. One reviewer called it more caramely than chocolatey. We were all really impressed with the quality of the caramel. This should come as no surprise, considering the long time family recipes being used and the expert chocolatiers making the product, yet we still were. It probably has to do with the fact that it’s not being bought in a specialty candy shop, but instead a large supermarket. So, you are pleasantly surprised by the high quality ingredients used in this product. Anyway, back to the caramel! To be blunt, it’s really good. It has great consistency, thick, but not too thick to bite into. The texture is very smooth, and not grainy like some caramel can get. And probably the most important thing about caramel, it doesn’t stick to your teeth! We also had a few other notes on the Snappers. We were impressed that Snappers were able to keep the pretzels crunchy despite being covered in chocolate and topped with caramel. On the other hand, they weren’t too crunchy to make it difficult to eat, making it once again, just right. One reviewer called them silkish and velvety. She also said they were more salty than sweet, but a good combination of both sweetness and saltiness. Another reviewer was expecting them to be too sweet, but they weren’t, and we imagine that’s due to the pretzel and the sea salt balancing it all out. We were bummed to get some broken pieces in the bottom of the bag that had no caramel, but we just learned that we should eat some broken pieces with the larger full pieces to balance it all out. Another good thing is that the bag contains a lot of Snapper pieces, roughly 50. Out of all of our reviewers most said they could probably only eat 3-5 at once, which means the bag is going to last you quite a while! At only $6.99 you should definitely grab one as soon as they go on sale, and if you like them, stock up before they go back to full price. Overall, Costco Insider gives the Snappers a 5 out of 5 star review. We were thoroughly impressed. If you want to find out more about the product we would suggest checking out SnappersSnack.com, Facebook or Instagram.